A quick notice to all those attending on Sunday; please park your car on Roe Lane and not in the Rookery itself. To try and improve our transport to away matches we asked members for their suggestions which we have considered when planning next season. Here is a general outline of our policy for the coming season. We have contacted TEN coach companies for quotes for this season but only got THREE replies from Elite, Vision and Alfa. Their quotes do give us some opportunity for improving our prices as you can see in the offers for the first four coaches of the season. As requested we have simplified the pricing structure which as agreed still gives a reduction in price for members. 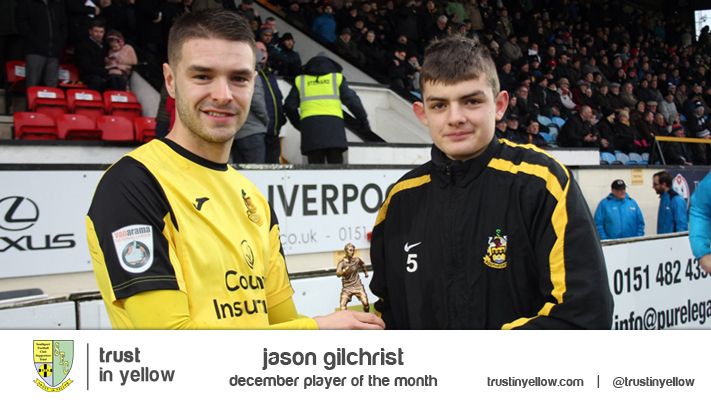 Usually this remains at £5 except when we are making a special offer as in the case to Macclesfield. There will be a further reduction for accompanied junior members though less than last year. Since we have suffered a loss in recent seasons when people have booked for the coach and then not turned up on the day we shall only guarantee a place if you pay in full (or at least a large proportion of the larger fares) in advance. Only paid for bookings will be considered when we are deciding whether a coach will run. This money will not be fully returnable unless people who can't travel contact us in advance with genuine reasons. In all cases we shall try and make a decision as to whether a coach will run at an early stage to allow supporters the opportunity to make alternative arrangements if we cannot run a coach. The decision will be made on the basis of the amount of money we have actually collected at that point to cover the cost of the coach. As requested we will improve our communications via our website and twitter and when booking on the coach please give us your contact details so we can get in touch if necessary. Members suggested some incentives for regular travellers on the coaches. We will consider at our next meeting whether we can offer reductions for their next trip to people who have travelled on five trips earlier in the season. Some members asked if we could arrive earlier or leave later at matches but they were in a minority. Because of congestion on the Motorways we do need to make early start from Southport for more distant matches. We will normally plan to arrive about 60-90 minutes before a match and because of the wishes of the coach companies (and majority of passengers ) will leave straight after matches. We are willing to experiment on one or two occasions with arriving earlier in one or two suitable towns but will consult with members first. Similarly we will be asking members shortly where they would prefer the weekend trip to be this season. We hope members will appreciate the efforts we are making to run the coaches at affordable rates but for us to be successful we need to have the support of members to book for trips early and to honour bookings made. Cheltenham (Saturday 15th August) £19 members; £14 accompanied junior members; £24 non members. The coach will depart the Merseyrail Community Stadium at 9.30am. Braintree (Saturday 22nd August) £29 members; £22 accompanied junior members; £34 non members. 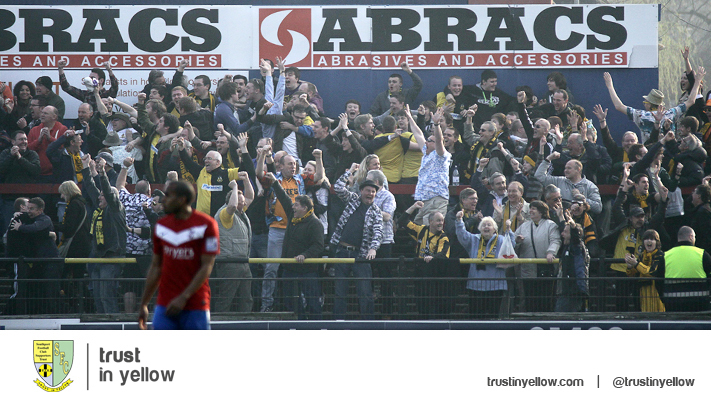 The coach will depart the merseyrail Community Stadium at 7.30am. 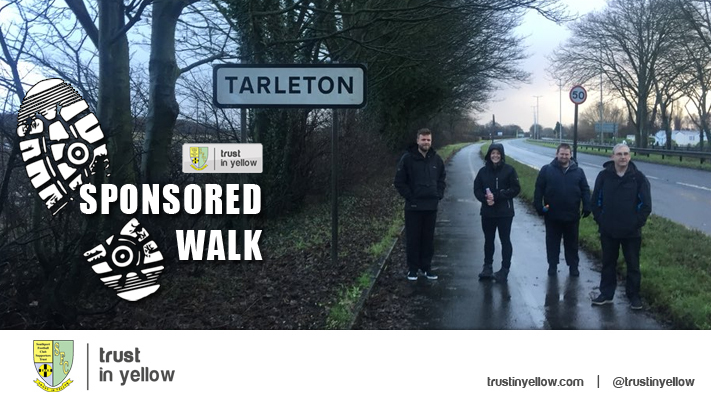 Barrow (Saturday 29th August) £14 members; £12 accompanied junior members; £19 non members. The coach will depart the Merseyrail Community Stadium at 11.30am. 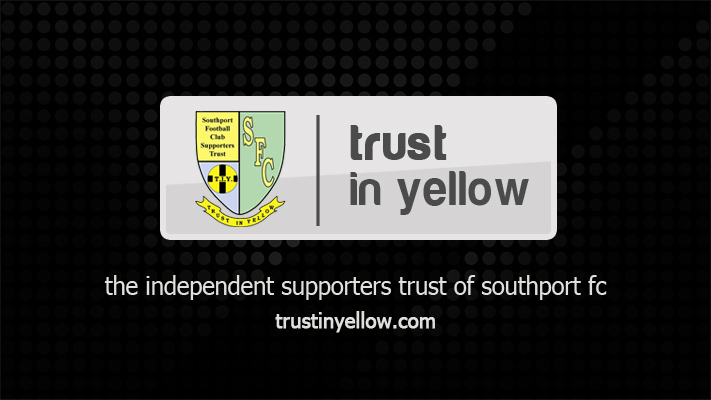 To book phone or text Colin on 07861 416859, e-mail fans@trustinyellow.com or caindow@googlemail.com, or call into the Trust office before or after a home game. Congratulations were due to Ben Highton who completed the Southport Half Marathon in 2 hours 19 minutes raising money for the Trust. The Trust's current available funds stand at £29,670.34. A large proportion of these funds will go towards the Trust's contribution to the floodlights project with the exact figure yet to be determined. The £15,000 in the 30 day notice savings account with Cambridge & Counties bank earned interest of £104.79 to 30th April. August is the month when the majority of memberships are due for renewal so it is expected that the next month will be a busy one. There will be leaflets handed out during the month promoting the Trust. 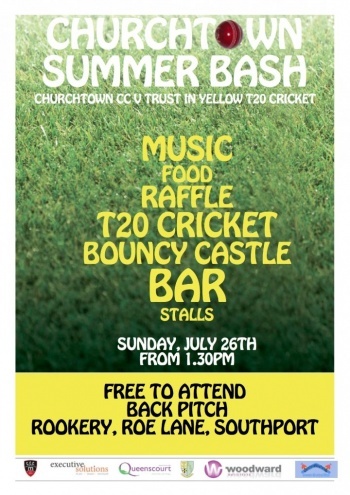 The Trust has a team of 12 to face Churchtown CC. 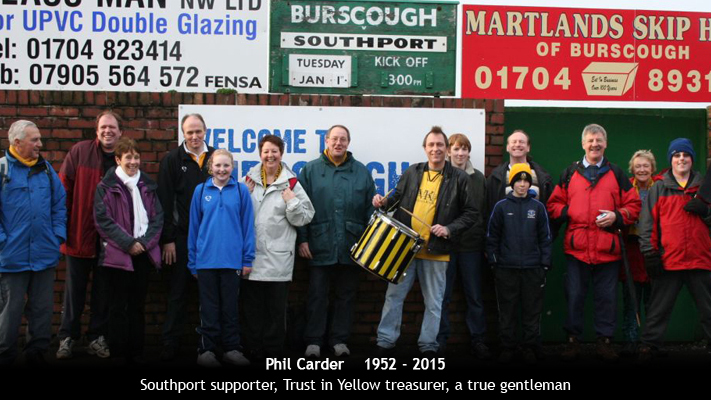 Fundraising will take place for Queenscourt Hospice and members of the Trust team are asked to wear Southport shirts. The Reunion is now just a couple of weeks away and most arrangements have now been finalised. The training sessions run by Richard Brodie have been extremely popular and it is positive that the event is bringing so many fans together. A DVD of the match will be produced and available to buy. All 140 tickets for the Grandstand Bar were sold in 4 days where there will be a Q & A session with a selection of players and a quiz. The Trust's AGM will provisionally take place at the beginning of September. Positions on the Trust Board will be advertised in the run up with up to 12 people permitted to be on the Board. The response from supporters has been excellent with the programme set to get underway with the Meet The Manager session on Saturday 1st August. The evening of Saturday 5th September will be a tribute night to Mark Heaton and Howard is liaising with Mark's family with regards to arrangements. The Race Night hosted by Tony Adams will take place on Saturday 10th October. Quotes have been received from Elite, Alfa and Vision out of 10 companies approached including some suggested by supporters. These quotes will be scrutinised with the aim of offering the best possible price to supporters. The coach to Macclesfield is already half full and a £100 donation has been received towards the cost of this trip. Also mentioned was the need to keep supporters better informed this season with regards to cancellations etc and the implementation of a more simplistic pricing structure. The next match signs will continue in their current format for the time being although a review of their effectiveness will hopefully be held in the next couple of months. The club's AGM takes place on 30th July and a meeting will be sought with Charlie Clapham afterwards to finalise the Trust's contribution to the floodlights project. Following the long awaited completion of the floodlights the Trust will hold a discussion with members over future projects. The Trust are delighted to welcome Howard Birch onto the Board and are keen for any other supporters who wish to get involved to get in touch or come to a meeting. Richard Brodie will be sponsored by the Trust for the forthcoming season.